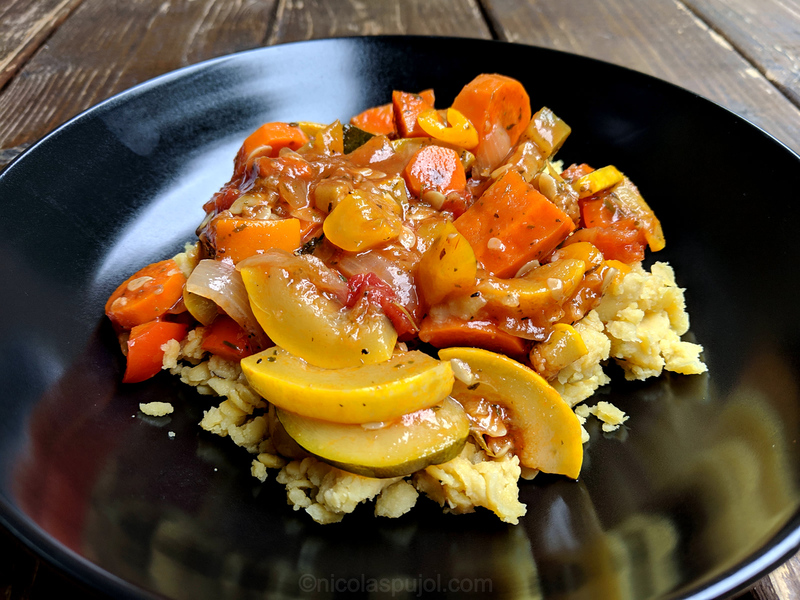 This ratatouille uses carrots as a substitute for eggplant. Like many of my recipes, the story from the ingredients and the preparation is that the customer is king. 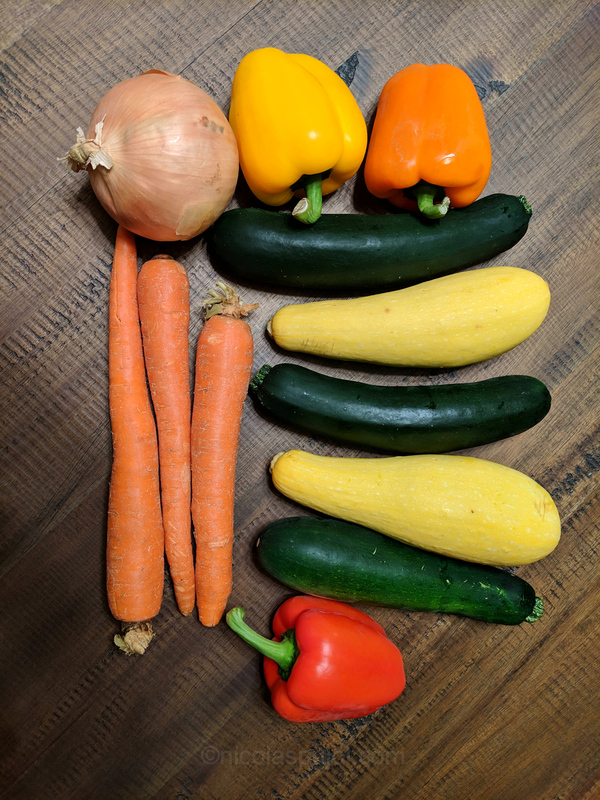 This week my customers are my two teenagers, and since I am cooking mostly plant-based meals, I am listening to their quirks. 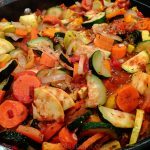 Marc does not like eggplant, but he loves the taste of French ratatouille , so I decided to make this ratatouille without eggplant (aubergine). The goal for my recipes is for them to be nutritious and quick to make. 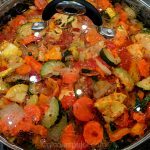 This easy ratatouille without eggplant takes more than 10 minutes, but less than an hour to put on the stove. 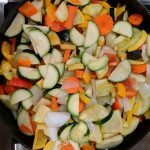 Given we are using many fresh vegetables and making a big pot in order to have leftovers for several meals, the majority of the prep time goes to slicing and cutting the vegetables. 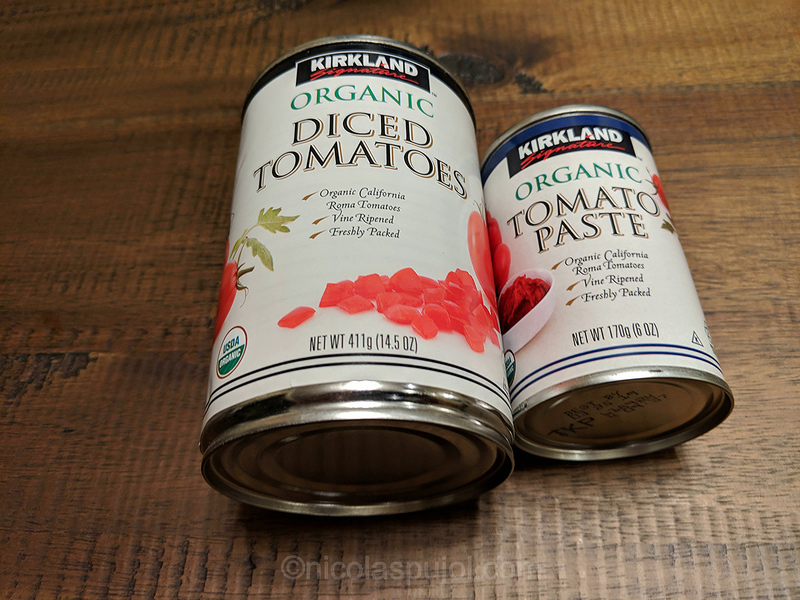 To make the process a little faster I used canned diced tomatoes which are already peeled. Also, the ratatouille may taste bitter with only tomatoes, so I added a can a of tomato paste, which adds extra flavor without too much extra liquid, and enhances the visual contrast with more red color. This eggplant-free ratatouille uses diced tomatoes and tomato paste. To substitute for eggplant, I used carrots. As they cook, and the longer they cook, the more carrots become sweet. For onions, this is a sweet yellow onion. Then we come to one of the secrets of a successful ratatouille, in my opinion: adding a small amount of honey at the end, before serving. This allows the honey not to lose its nutrients during the long cooking process, and you can mix it in homogeneously before serving. Guests should not be able to tell there is honey in it, but if they are aware there is some, they might be able to recognize a very slight flavor. 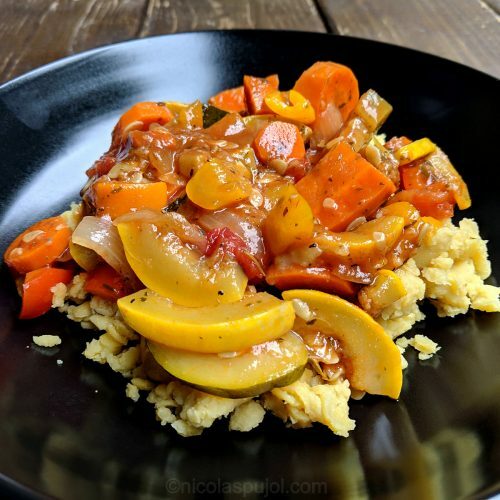 For this photo, the ratatouille is served on a bed of pigeon peas, which compared to rice or pasta, provide a natural source of iron, magnesium, vitamin B6 and calcium. Rinse and slice / cut all vegetables in small pieces, then place them in a very large pan. Add the tomato paste, the diced tomatoes, avocado oil, and all spices except for honey and olive oil. Bring to boil on high heat, mixing every 5 minutes, for 10 to 15 minutes. Reduce heat to simmer, cover with lid and slow cook for another 30 to 60 minutes. 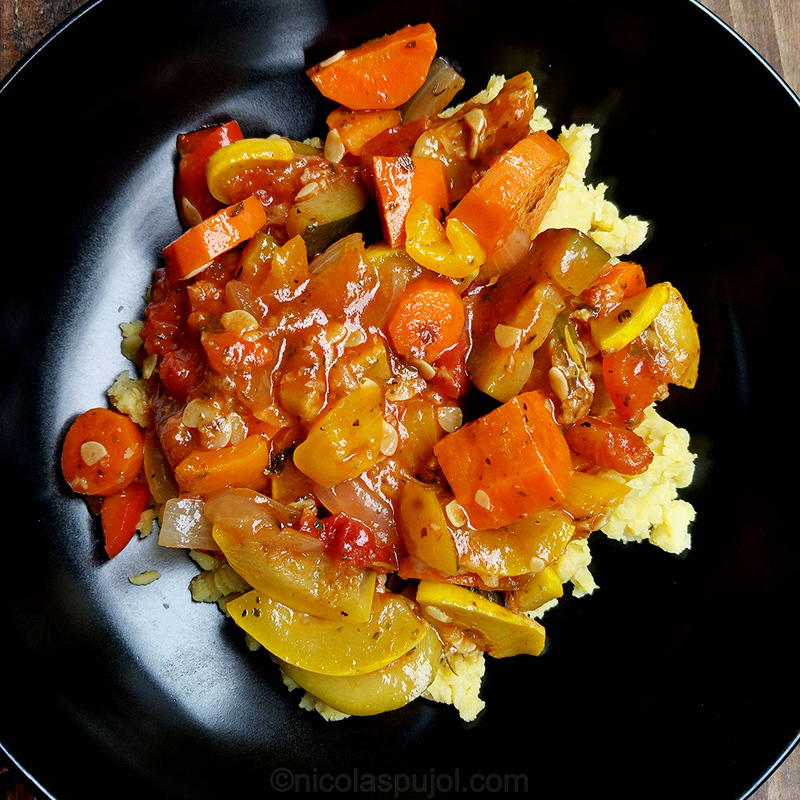 The longer the ratatouille cooks the softer the vegetables will be, and the taste will also be slightly sweeter. Once fully cooked, sprinkle a bit of honey and olive oil. Taste and adjust salt and pepper as needed. Serve as is, or on top of rice, pasta, peas or lentils. Side dish: brown rice, lentils, white rice, peas, or pasta.